Timati's patriotic adventures land him in prison in the city of sins. UPDATED on Jan. 27.: Since then, LAPD’s press department issued a statement that no such incident was recorded near the Hollywood sign. Normally, all incidents are recorded with the time and date of the detention. But this still made for a pretty fun Friday in the RuNet! Timati: love him or hate him. But you certainly can’t ignore him thanks to all kinds of stunts this Russian rapper pulls and then documents on social media. His most recent stunt has furthered his notoriety beyond Russia. 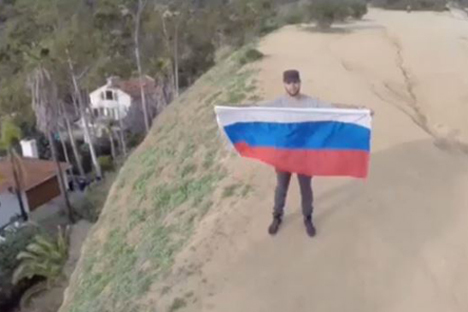 This morning a video came out on Timati’s Instagram account in which we can see him mounting the Hollywood Hills and flying the Russian flag loud and proud on the backdrop of one the most iconic symbols of the land of the free. The caption to the video mentions that LAPD wasn’t too impressed so they went ahead and arrested Timati and his posse. And yes, that is “Kalinka” playing in the background to add to the already patriotic mood. Russian Instagrammers were not left indifferent to the video and in the first 4 hours, Timati’s latest stunt brought on almost 60,000 likes! Comments from his loyal followers show their solidarity and wholehearted support: bravo, well done, great soundtrack, awesome hoorah hoorah. One user, however, advised Timati to bring the Chechen flag next time. Though we’re not sure how relevant that is given the rapper’s Tatar/Jewish heritage.